The San Antonio integrated medical complex is the largest single medical facility operated by the Department of Defense. 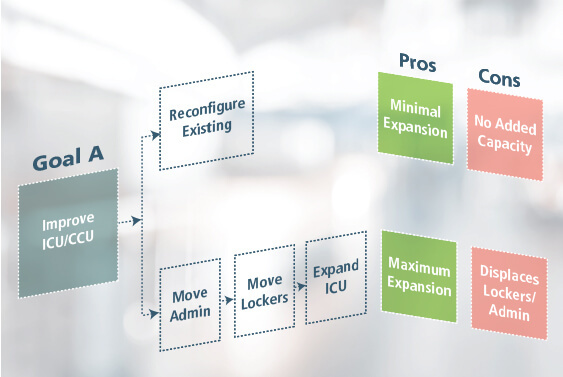 Its reconfiguration—based on analysis, planning, and programming led by The Innova Group—eliminates duplication of facilities and equipment and optimizes the use of personnel, providing both substantial cost savings and operational improvements. As military operations are streamlined under the Base Realignment and Closure Act (BRAC), San Antonio’s role in healthcare for U.S. forces and their families is becoming even more vital. One of the largest BRAC projects is the integration of the area’s two world-class military teaching hospitals, Brooke Army Medical Center (BAMC) at Fort Sam Houston and Wilford Hall Medical Center (WHMC) at Lackland Air Force Base. WHMC will be replaced by a $465 million, 645,600-square-foot comprehensive outpatient clinic, to be named Lackland Ambulatory Care Center; and BAMC, renamed San Antonio Military Medical Center North, undergoing a $556 million renovation and expansion, will handle all military trauma and inpatient care and most specialty care for the region. The Innova Group led the planning efforts for this undertaking, developing an integrated approach for the realignment of healthcare services and graduate medical education programs. After analyzing use patterns, forecasting workloads, and translating these calculations into space requirements, Innova’s team facilitated schematic design sessions to identify the best use for each existing building. To support follow-on design by architectural firms, The Innova Group documented departmental concepts of operations, provided space and functional programming, and employed DOD Space and Equipment Planning System software to devise equipment plans for each campus.